Note: This example builds on the previous example titled: Adding a Timer to Schedule Readings. Only the sections of code which have been changed or added are discussed here. However, a full copy of the complete sketch can be found at the end of this page. 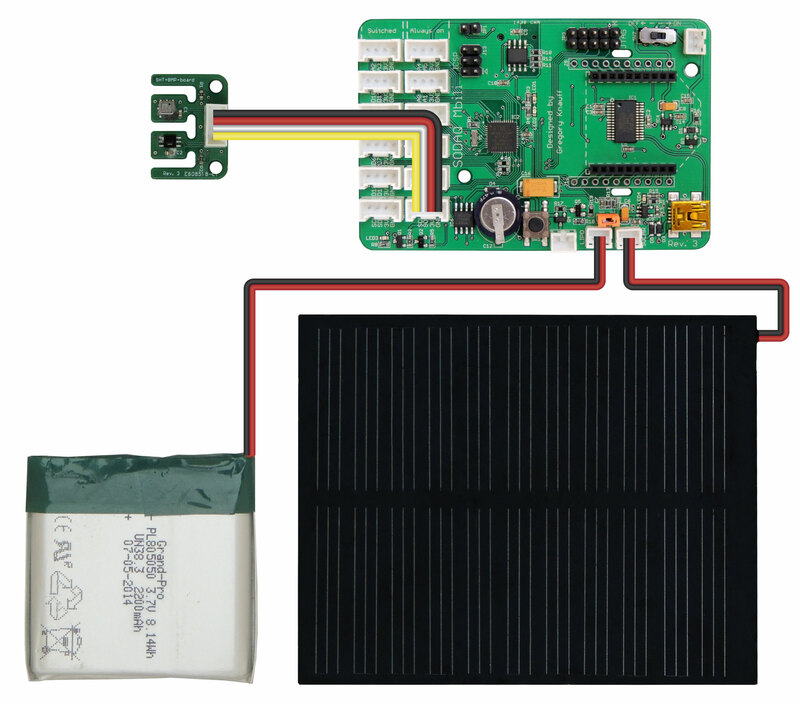 In this example we will demonstrate using the Serial Flash storage on the SODAQ Mbili to store the data which has been read from the sensors. This example builds on the previousAdding a Timer to Schedule Reading example, but instead of using the MicroSD device for storage it uses the Serial Flash storage. Unlike with the MicroSD storage, the Serial Flash does not have a file system but is essentially a large linear storage buffer. This storage buffer is divided into pages each storing a fixed amount of data. In the case of the AT45DB161E there are 4096 pages each capable of storing 528 bytes. The Serial Flash storage is not accessed directly but through one of the two available SRAM buffers. To read data from the Serial Flash, first the specific page on which that data exists must be copied onto one of the SRAM buffers. Then that data can be access via that SRAM buffer. To write data to the Serial Flash, the data must be first copied onto one of the SRAM buffers and then that buffer is written to a specific page. The Sodaq_dataflash library contains the class Sodaq_dataflash which provides the functionality for working with the Serial Flash storage. The library also declares a global object of type Sodaq_Dataflash named dflash. Note: The AT45DB161E has two available SRAM buffers, however, the current implementation of the Sodaq_dataflash library only uses the first buffer. 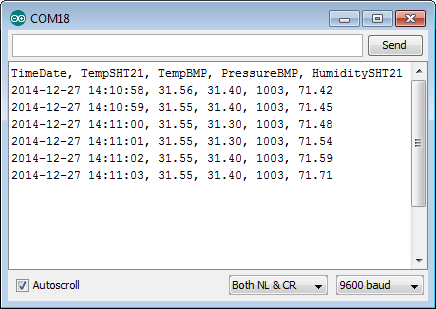 The Sodaq_dataflash library is included with the SODAQ Mbili files that you have already installed. In addition to the existing libraries, we must now also include the Sodaq_dataflash library in the sketch using the #include compiler directive. Here we first define the number of memory pages (NUM_PAGES) and the size of each page (PAGE_SIZE in bytes). The values for the AT45DB161E are 4096 pages each with size of 528 bytes. Additionally, we define the character(s) which specify a new line. These are platform specific and ere we specify the newline characters for the Windows platform. We also declare two global variables which define the current page and current position (address) on that page. These are both initialised to 0. The line #define DEBUG specifies a preprocessor directive DEBUG. This is used throughout the sketch to switch on or off sections of code. For testing purposes, additional sections of code have been added which are used to copy the stored data from the Serial Flash onto a file stored on the MicroSD card. If this line (#define DEBUG) is commented out, all sections which fall between #ifdef DEBUG and #endif, will be ignored by the compiler. For example: Three additional global variables have been defined here in one of these DEBUG sections of code. These are used to track the current reading number, to specify how often to copy the data to the MicroSD card, and to keep track of whether the Serial Flash buffer has wrapped to the start. We have also moved the MicroSD constants into this section as they are only used in a DEBUGВ sections of code. Here we initialize the data flash storage with a call to dflash.init() passing the parameters for the pins: MISO, MOSI, SCK, & SS. Additionally, if the DEBUG compiler directive has been defined, we also attempt to initialize the MicroSD device, and display an error message (in the Serial Monitor) if that fails. In the existing example, the user defined method createDataRecord() generates a String which contains the readings in Comma Separated Values (CSV) in ASCII format. This String is then passed as the parameter rec to this method logData(). Arguably it would be more efficient to store the data in a binary form to reduce the storage space requirements. However, to keep things simple we will leave the createDataRecord() method unchanged and simply modify this method to now store the data on the Serial Flash. Here we start by adding the newline character(s) to rec. Next we copy the data from rec into a buffer of type uint8_t as this is the format used by the methods in theSodaq_dataflash library. Note: The method String.getBytes() automatically sets the last character of the buffer to be the null termination character (\0), and so it is necessary to specify a buffer which has space to store one additional character. First we check to see if the amount of data we need to write fits in the current page. If it does, we then copy it to the SRAM buffer using dflash.writeStrBuf1() and then write that SRAM buffer to the current page using dflash.writeBuf1ToPage(). We then increment the address on the current page to equal the address of the position after the data we just wrote. If the data does not fit on the current page, then we must take a few additional steps. First we calculate how much of the data can fit on the current page and then write that portion of the data to the current page using the steps listed above. Next, we increment the current page and by using modular division % 4096 we ensure that value of Page is always in the range of 0…4095. This causes Page to reset to 0 when it reaches the end (wraps). If DEBUG is defined and if Page has wrapped to 0, we set the boolean HasWrapped to true. We then write the remaining data to the new page using the same steps as above. Finally, if DEBUG is defined we check to see if we are due to copy the data from the Serial Flash storage to a file on the MicroSD card. If so we call the user defined method copyToSDCard(). This method is used to copy the data from the Serial Flash storage to a file (DataLog.txt) on a MicroSD card. This code is enclosed within the DEBUG compiler directive and is only included in the compiled sketch if DEBUG has been defined. First we attempt to delete the log file if one already exists. We then create a new file and write the data header to the first line. Next we copy each of the full pages from the Serial Flash storage to the file stored on the MicroSD card. There are two scenarios here. If the Serial Flash storage has wrapped, we start by copying all the full pages which have an index higher than the current page. Then we copy the full pages that have an index lower than the current page. If the we have not wrapped we do not need to copy the full pages with indexes higher than the current one. We then copy the data from the current page, the amount of which depends on how much of the current page we have filled so far (specified by the data before Address). Finally we close the file which saves it to the MicroSD card. If you remove the MicroSD card and insert it into your PC you should find a file (DataLog.txt) in the root folder which contains the same data as was shown in the Serial Monitor.